Hello Everyone!!! Hopefully you all had a wonderful weekend! I had lots of good luck as I had Esmeralda tell my fortune before I left on Saturday afternoon. Who is Esmeralda... sorry, let me make a formal introduction. Esmerald, please say Hello! 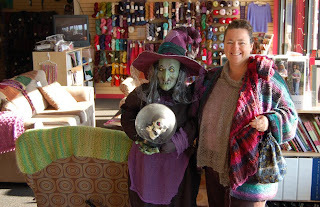 (Um...she is the one of the left, with the hat :) She is a wonderful greeter in the shop and queen of the Fall Sale Spooktacular. She sings, dances and tells fortunes.... come stop by and have your fortune told - don't forget to take a picture as she is very photogenic! Now we have been talking about the Salem Witch Trials for quite a few days now... to get some more perspective on the subject, Jerry and I went to Salem MA for another research trip. Thankfully, Jerry is very good with his camera and very tall. We arrived at Pioneer Village at Forest River Park ten minutes too late to go in and visit; although there were very high fences surrounding the Village, Jerry simply tipty-toed with his camera to get these great shots of the homes of the Puritans. Pioneer Village is a replica of the Puritan village in 1630. When visiting, you are guided through the Village by costumed guides who narrate and demonstrate the lives and responsibilities of these early settlers. It is quite a unique experience for the first timer. 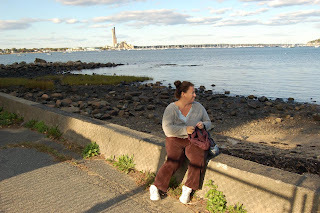 I sat and knit, as I am way to short to be taking pictures over a fence, and enjoyed the beautiful view off the beach of the ocean and Salem Power Plant (which I swear you can see for hundreds of miles away). You can see the reflect of the barbed wire fence shadow that surrounds Salem Village on the wall where I am sitting... I wonder if the fence is there to keep us out or the witches in? While in Salem though, as much as one is surrounded with Halloween/Witch shops and merriment, testiments to the Witch Trials can be found all around the city. Near the courthouses in downtown Salem on Washington Street, sits this plaque. "Nearly opposite this spot stood, in the middle of the street, a building devoted from 1677 until 1718 to municipal and judicial uses. In it, in 1692, were tried and condemned for witchcraft, most of the nineteen person who suffered eath on the gallows. Giles Corey was here put to trial ont he same charge and, refusing to plead, was taken away and pressed to death. In January, 1693, twenty one persons were tried here for witchcraft of whom eighteen were acquitted and three condemned but later set free. Together with about 150 accused persons, in a general delivery which occurred in May." Enjoy your Day and Todays Sale! And don't forget to vote for todays poll on the blog. Thanks! 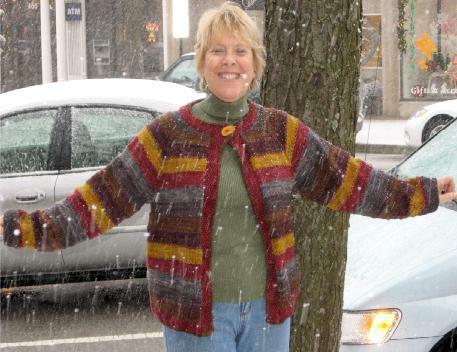 Question: If given a choice, what garment would you like someone to knit/crochet for you in ORANGE yarn? So if you are wondering what to make for your favorite Halloween goblin, it appears as though they may want Orange Mittens! The Sophisticate Cardigan Sweater uses six colors of Dream in Color Classy Worsted Superwash Merino for this wonderful sweater. 1 skein each color for sizes XS, S and M; 2 skeins of border color and one skein each of remaining colors for sizes L and XL. The colors used for this model are Cocoa Kiss, November Muse, Gothic Rose, Strange Harvest, In Vino Veritas and Cloud Jungle. 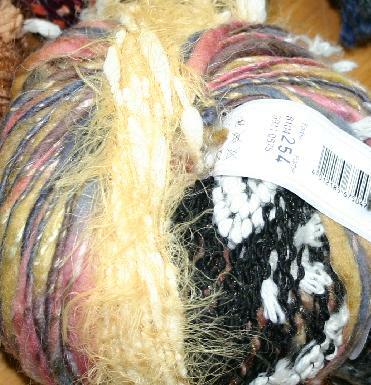 The sale on the sock yarn from yesterday's post - Monday, October 14, 2008 - will run through Friday at 12:00. 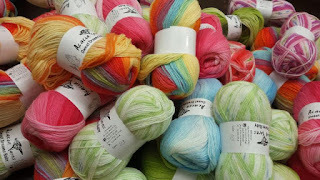 Please see yesterdays blog entry for the Socks on the Brain sale. Thanks! And Finally - The Rules of the Sale:All items purchased on sale are final sales. Sale applies to in-stock items only. In the event that an item cannot be found in our physical inventory a substitution or refund will be offered. The sale discount cannot be combined with other discounts. Please try to checkout by 11:59 AM EST to be sure to receive the sale price.